When Wednesday evening rolls around, there is a fun thing to do mid-week. 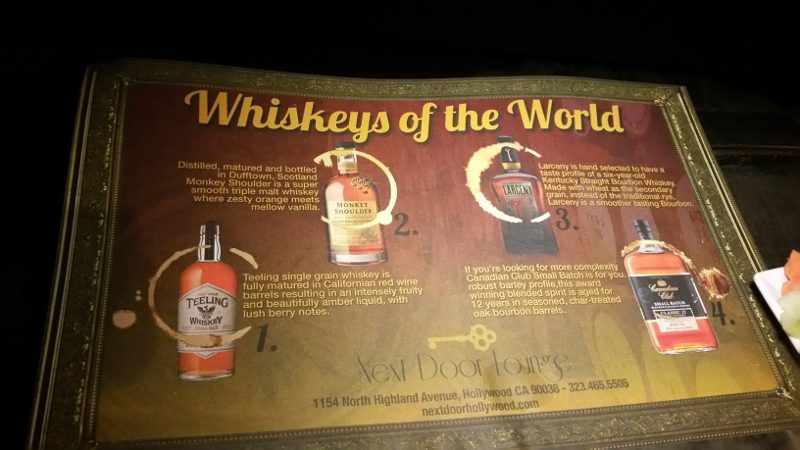 Head to Next Door Lounge in Hollywood for a whiskey tasting. 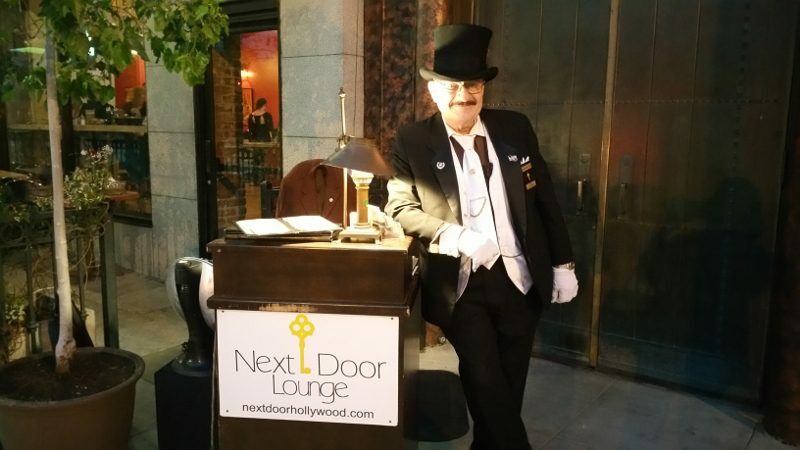 Next Door Lounge is a speakeasy on Highland Ave that has been open for four years. If you haven’t been there yet, you have probably driven by many times. Outside is “The Dapper Doorman” Colonel James Anderson. Since day one, he has stood outside the doors, dressed in a top hat and tap shoes. Don’t mess with the dapper doorman. While he smiles and greets you and checks your reservation, he is also security. 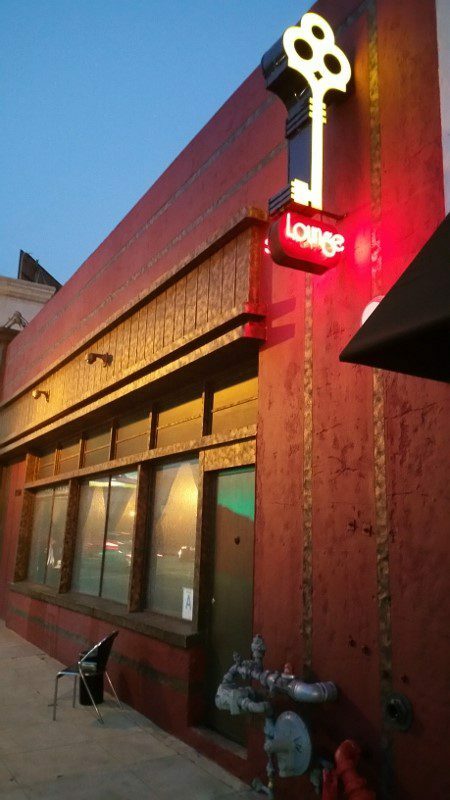 A reservation is suggested (but not required) to get into the Next Door Lounge. We were escorted to our lounge seats. Our server, dressing in a 1920s flapper dress, set up our table with a whiskey tasting mat, 4 glasses and plates, as food in provided as part of the tasting. Head Barman Zac Henry came to the table with 4 bottles of whiskey and sat down to join us. As he poured the whiskeys, he gave us a few tips to tasting whiskey. 1) Don’t put your nose in the glass, like you do for wine, or it will burn your nose hairs. Put your nose at the top of the glass and breath in. 2) “Kiss” the whiskey. 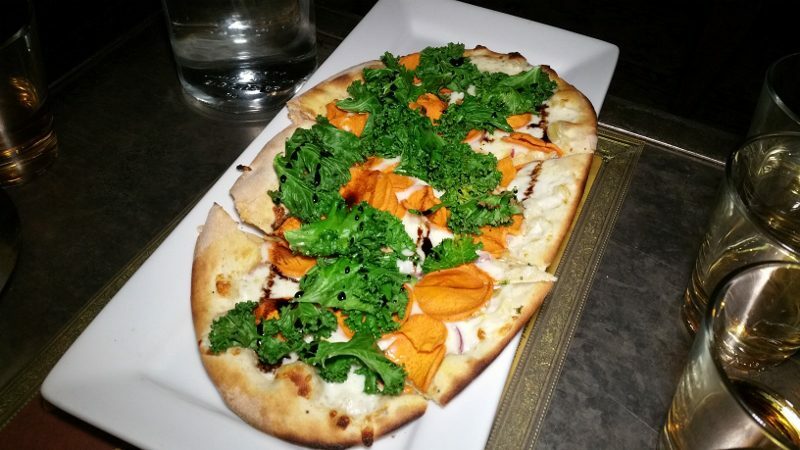 Let just a little bit touch your lips to wake up your palate. 3) Take a small sip, roll it around in your mouth, swallow but keep your mouth closed and breath through your nose. 4) Add a couple drops of water. The impurities in the water wake up the alcohol molecules. With that said, he took us through the four whiskeys, explaining the difference between each one, how they are made and how to taste. We had Teeling (a single grain whiskey that is matured in California red wine barrels), Larceny Bourbon (made with wheat as the secondary grain instead of the traditional rye), Canadian Club Small Batch (aged for 12 years in seasoned char-treated oak bourbon barrels) and Monkey Shoulder (a triple malt whiskey distilled in Scotland). 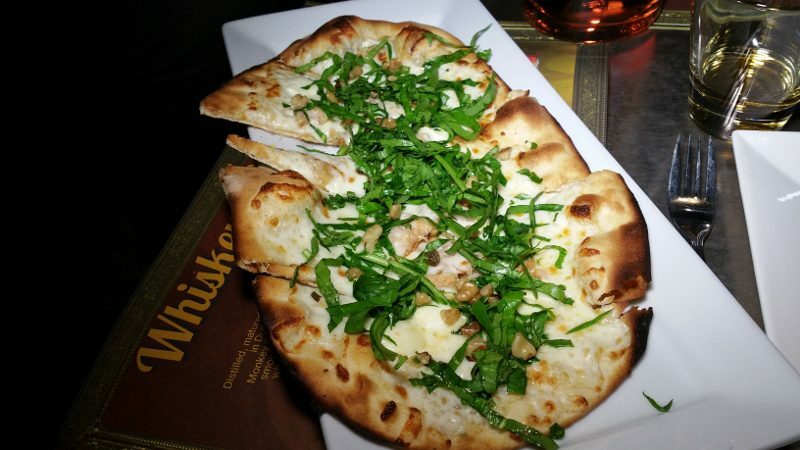 Along with the tasting, we were served a plate of hummus and pita as well as two pizzas. All in all, not a bad way to spend a mid-week night. 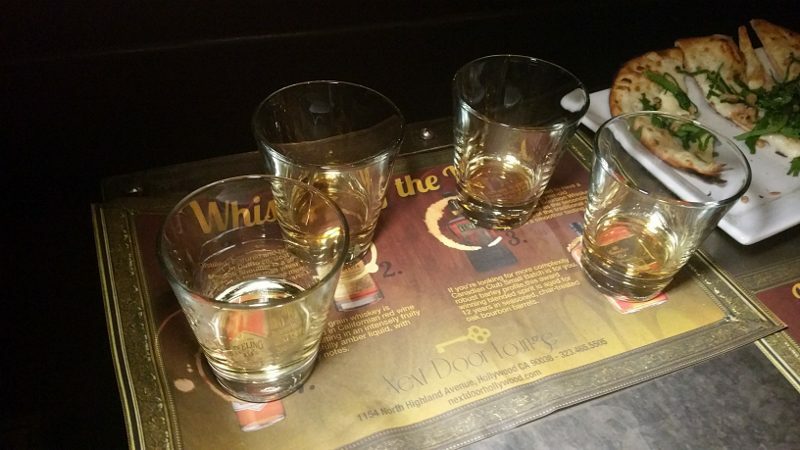 The whiskey tasting with 4 flights, the whiskey Master, hummus, pita bread, flat bread pizza, marinated vegetables and spaghetti pretzels is $35.00+tax+gratuity. Turn your next Wednesday into a Whiskey Wednesday! This entry was posted in Cocktails and tagged DrinkWire, Hollywood, Liquor.com, Next Door Lounge, whiskey, whiskey tasting, Whiskey Wednesday, whisky by Allison Levine.